Nurse Mare Foals are, primarily, a creation of the horse breeding/race horse industry. An expensive mare is bred to a very expensive stud. Eleven months later she has her foal. Seven to ten days after she gives birth she comes into heat again. To remain profitable, she must be bred again, immediately, so that she can have another foal in eleven months, thereby producing the most mature foal for the following year. The mare’s seven to ten day-old foal cannot travel back to the stud/stallion’s farm with the broodmare, as travel is considered to be very risky for the newborn, valuable, foal. 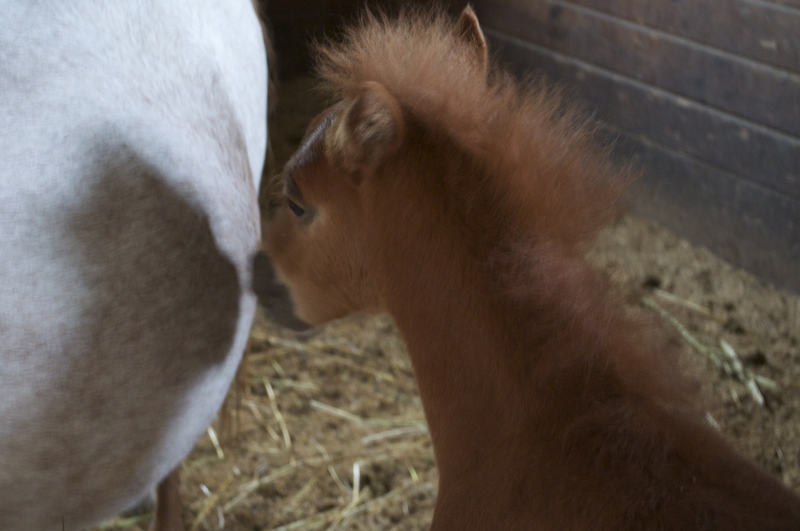 Additionally, insurance costs are prohibitive for the foal to travel with its mother. So, instead of putting this foal on a milk replacer product, they rent a mare from a nurse mare farm. In order for the nurse mare to come into milk, it must have given birth to a foal. The mare is bred and she gives birth to her foal. Once a request is received from the “expensive foal’s” farm, the mother is taken away from her own foal and shipped off to be a surrogate mother, to that expensive foal. What happens to the nurse mare’s foal? No foal should be raised without it’s mother. The Nurse Mare Program DOES exist, however, and likely, will continue to exist. We try to create the best situation possible, for the foal’s, by helping them to survive – every way we possibly can. Reach Out to Horses and a team of equine professionals have come together to save the lives of these mares in foal as well as the foals torn from their mothers, in this industry unfamiliar to most. Nurse mares have been around for hundreds of years. They were used if a foal was rejected, or if the mother died while giving birth. This industry started out to be a good thing … since then, however, it has morphed into something much darker and morally unethical. Nurse mares are bred so that they will come into milk. The milk that is produced, however, is used to nourish the foal of another mare – a foal that, commercially, is worth much more money. Her own foal then becomes what the industry terms as a “bi-product” and as such, is destined for the feedlot. To this end, farms have been established in key locations, throughout the United States, in order to supply “high end” breeders with nurse mares, in a quest to support their expensive foals. Nurse mare farmers keep lactating mares on their premises before, during and after the foaling season. When a mare’s services are needed for a client, the farmer separates the nurse mare from her natural foal, then ships out the mare. Some nurse mare farms will occasionally give the foals away, but most sell them discreetly for profit. Most nurse mare foals are usually available in January and February. This is when the “season”, so to speak, starts and foaling begins. Generally, the season runs from January to mid-June. Adopting a foal is literally a life or death decision for one of these innocent nurse mare babies. Adopters are directly responsible for saving a foal from a tragic, brutal death. Sadly, not all of them can be rescued. Rescuers in most cases, must purchase these foals and pay anywhere from $100 to $400 per foal. They also incur all costs of housing, feeding, vet care and training, until the foals can be adopted out to their forever homes. Any and all support is welcome from those willing to help! Previous postSherlock Homer hit the Jack Pot! Next postWorkshop with Melisa Pearce & Anna Twinney in Connecticut!